A deal for the new units at Kudankulam is imminent according to V Narayanasamy, who added that the second unit could into production by September 2014. Russia and India have almost finalised a deal for the third and fourth units of the Kudankulam Nuclear Power Project (KNPP), India’s Minister of State for Atomic Energy V Narayanasamy told reporters in Delhi on Wednesday, according to a PTI report. “Negotiations with Russian government have almost crystallised,” Narayanasamy was quoted by the news agency as saying. The minister agreed that India’s civil nuclear liability law was becoming a “liability” while negotiating with different countries for reactors, PTI added, in a report carried by The New Indian Express. The problem with KNPP’s 3rd and 4th reactors came as result of the approval by Indian Parliament of the Civil Liability for Nuclear Damage Act in 2010, which allows the nuclear operator the right to demand compensation from a supplier in case faulty equipment causes an accident at a nuclear power plant. India wanted to bring the proposed units 3rd and 4th to be constructed at Kudankulam power plant, under the purview of the civil nuclear liability law. But Russia objected to the application of the civil nuclear liability law to these units, demanding that the same terms and conditions of KNPP’s units 1 and 2 should also be applied to units 3 and 4. India chose not to apply the civil nuclear liability law to units 1 and 2, arguing that they were constructed under an original 1988 agreement - long before the 2010 Civil Liability for Nuclear Damage Act. The bilateral agreement on KNPP’s units 1 and 2 puts the onus of any liability on the operator and there is no provision in it for recourse to suppliers. “Ninety per cent of the work on the Unit-II has been completed and it could go into production by September,” Narayansamy said earlier. The first unit would reach its full capacity of 1,000 MW by the end of February. 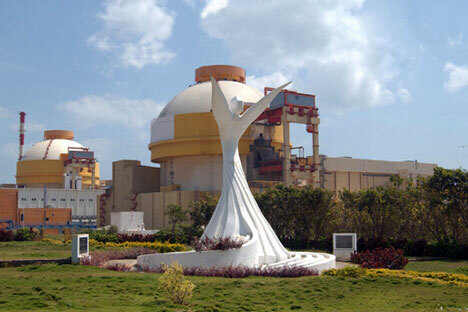 The Kudankulam units comprise of 1,000 MW reactors of the VVER-1000 model being constructed by NPCIL and Russia’s Atomstroyexport, a subsidiary of Rosatom.